Unacast has partnered with Chooose to offset the climate and carbon footprint we as a company make on our beautiful planet. Chooose uses this money to buy carbon credits and throw them away so that big polluters can’t buy their way out of their climate problems. In addition, Chooose takes the money and invests in green energy and similar climate positive actions. Chooose is the world's no. 1 platform for climate positivity. They engage the silent majority with low barrier and high impact tools that makes it fun and easy to battle climate change. With their subscription service and climate positive plugins they are making people and companies climate positive, by oﬀsetting more CO2 than people, products or services leave behind. 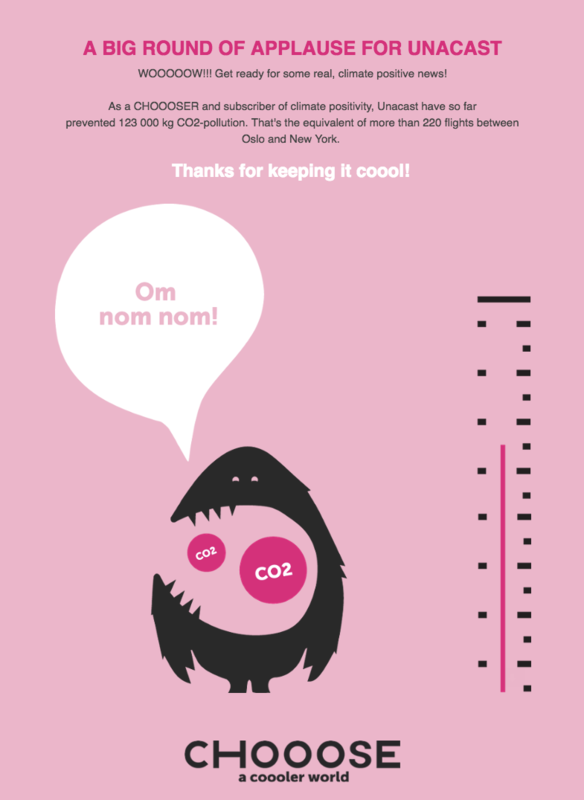 Did you know that if you stop driving, recycle everything, stop eating meat, stop ﬂying… well, basically stop every action that pollutes, you would only reduce about 1/3 of your personal CO2 footprint? The big problem is the big polluters! You see, while we reduce, reuse and recycle, a single coal plant in Poland pollutes more than 6 countries in Europe combined. How do they get to do that? Listen to this: industries need permits - carbon credits - to release certain amounts of CO2 into the atmosphere each year, and when they run out of carbon credits, it's cheaper and easier for them to buy more instead of changing their ways. On behalf of people and companies Chooose buy carbon credits from the closed marketplace, tear them apart and throw them in the trash — making them unavailable for the big polluters. The money for the carbon credits goes to UN regulated CO2 reducing projects in developing countries. Less carbon credits, also makes the price of pollution go up, so that the dirty businesses must clean up. If you recycle everything at home for the next 50 years — it will have the same climate eﬀect as ONE month with Chooose.